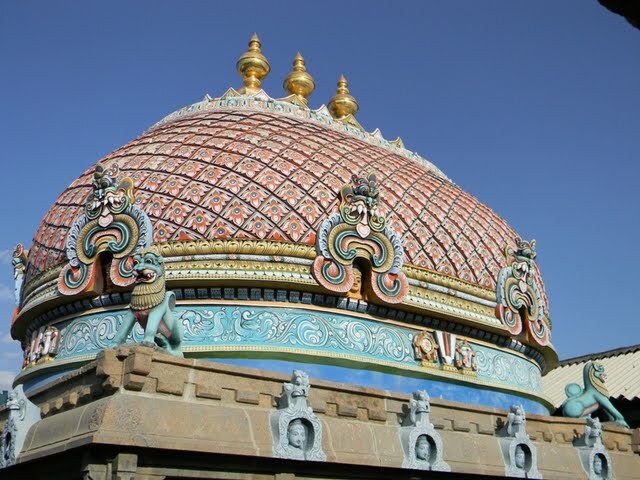 4 kms east of the cracker town of Sivakasi on the Srivilliputhur - Virudhanagar road, is the Ninra Narayana Divya Desam in Thiru Thangal. 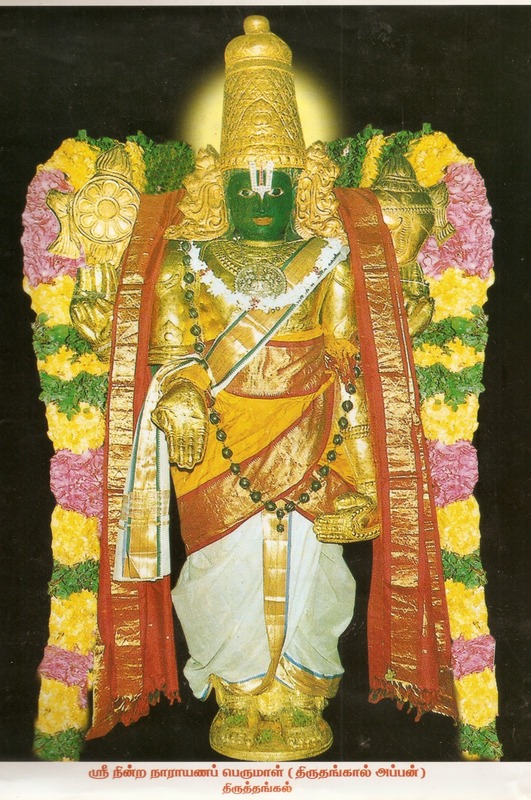 The Lord is seen in a standing posture atop a hill(the Thangal Malai). 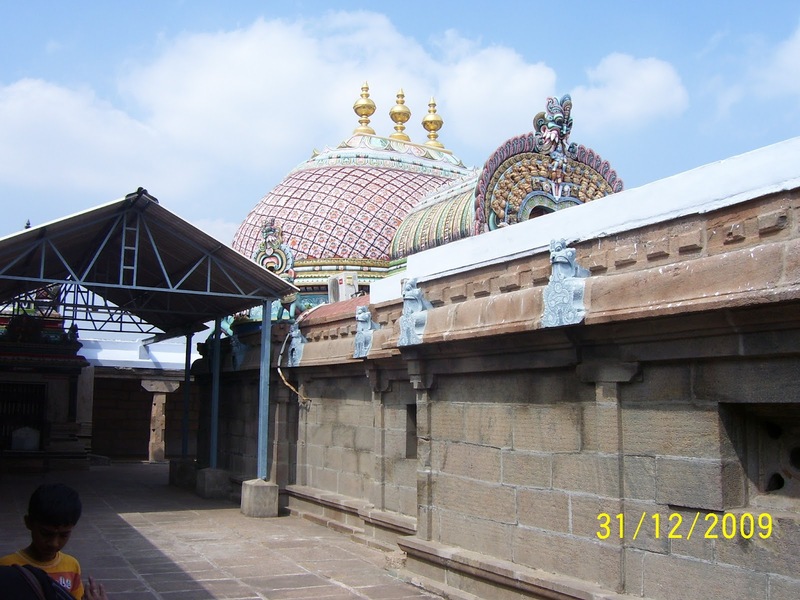 There is the Lord Ranganatha Sannidhi on the Western Entrance, from where one has to climb 10-15 steps to reach the Ninra Narayanan Sannidhi. The Andaal Divya Desam at Srivilliputhur is about 25Kms(West) from here. A fight arose between the three Devis- Sri Devi, BhooDevi and NeelaDevi- as to who was the senior most among the three and the favourite of the Lord. To prove her status, SriDevi came down to this place and undertook penance near the ‘Thangala hills’. Pleased with her prayers, Lord Vishnu appeared before her and acknowledged that she was his favourite. In memory of this event, this place came to be called ‘Sri’ Puram. It is believed that Bhoodevi and Neeladevi agreed with this verdict of the Lord and decided to stay here at this place. Every year, on the 5th day of the Tamil month of Aadi, ThiruThangal Appan goes to SriVilliputhur, about 25kms from here. PeriyaAzhvaar praises the Lord in the morning, while Garuda Sevai is a special feature in the evening. The next morning, 6th day of Aadi, ThiruThangal Appan takes flowers from Andaal, another unique occurrence. Inside the sanctum, one can see as many as 11 idols, the only Divya Desam to have these many idols within the sanctum. The idols are: Deiveeka Vasudevan, Sridevi, Neeladevi, Bhoomadevi, Brigu Rishi, Markandeya Rishi, Garuda, Arunan (Suryan’s Charioteer), Anirudhan, Ushai and Jambavathi (only temple to have an image of Jambavathi). 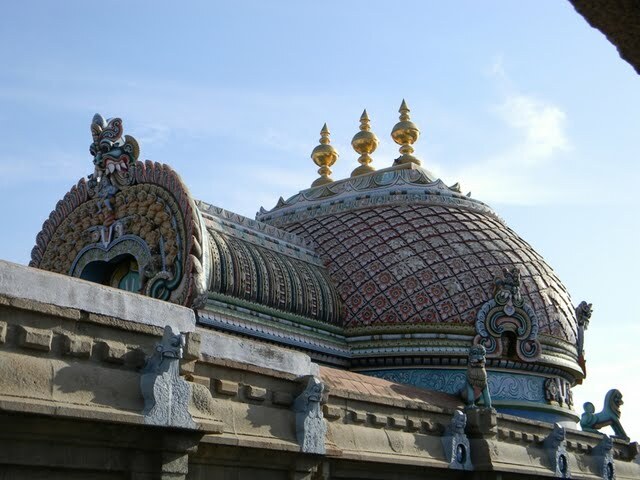 A unique feature at this Divya Desam is that Garuda is seen along with his traditional enemy, ‘The Serpent Lord Aadhiseshan’. Garuda is also seen adorned with jewellery. Krishna’s grandson Anirudhan got married at this place to Baanaasuran’s daughter Ushai. It is believed that Deiveega Vasudevan came down to attend this wedding. Once a fight arose between a sacred Banyan tree and Aadhiseshan as to who was more powerful. They went up to Brahma who decided in favour of Aadhiseshan as it was on the Serpant Lord that Lord Vishnu slept. Unhappy with Brahma’s decision, the sacred tree undertook penance seeking Vishnu’s blessings. The Lord asked him to go to ThiruThangal and take the form of a hill. Fulfilling his wish, the Lord would come there to the hill and accept SriDevi, who was undertaking penance, at the foot of the hill. Festivals: Pujas in the temple are performed for Mother Goddess first and only then to the Lord. 12 days Ani Brahmmotsavam (June-July), 5 day Chitra Poornima festival in April-May, 10 day summer festival (Vasanthotsavam in May-June), Krishna Jayanthi, Pavithra Utsav, Navarathri, Karthikai Deepam, Vaikunda Ekadasi, Koorathazhwar festival, Panguni Wedding festival in March – April, Purattasi Garuda Sevai (September-October), Tamil and English New Year days, Pongal and Deepavali are the festivals so grandly celebrated in Thiruthangal temple. 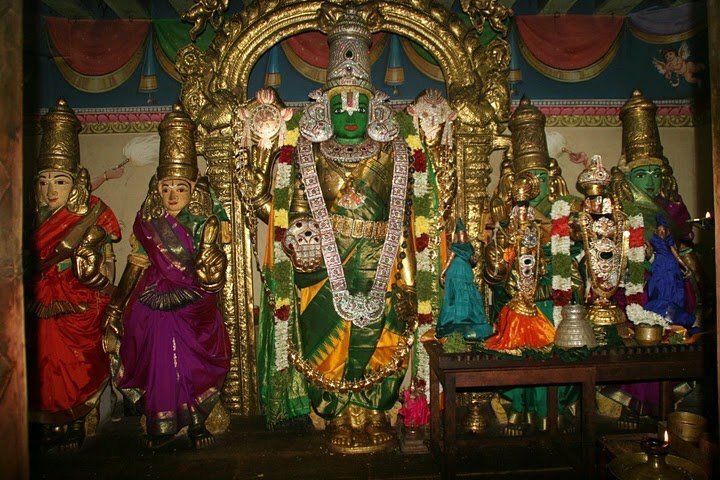 Among the festivals, the visit of Lord Nindra Narayanan to Srivilliputhur temple on the 5th day of the Adipooram festival (July-August) is a unique event. The temple is open from 06:00 a.m. to 12:00 noon and from 04:00 p.m. to 08:00 p.m.
Thiruthangal is 24 Kms from Virudhunagar, 4 from Sathur. Devotees visiting Thiruthangal may find convenient lodgings in the nearby Sivakasi Town. Conveyance facilities are available from Tirunelveli and Virudhunagar. Nearest railway stations are Sivakasi and Virudhunagar and the airport Madurai. Mappilai Bhattar @ 94425 47533.
mapilaibhattar is not a priest of sri nindra narayana perumal temple;our temple executive officer no8489833410;priest v anantha sayana bhattar no 9443570765.
thiruaadipura 5th day utsavam mangalasasanam and garudaseva:-);@ALL ARE INVITED.